Did Little Havana Just Go Blue? This is a guest post from political scientist Ben Bishin. Tuesday’s results highlighted the large and growing role that Latinos play in American politics. One particularly salient result suggests that Cuban Americans have finally taken the long awaited step toward embracing the Democratic Party. Journalists using the National Exit Poll report that in Florida, home to over two-thirds of the nation’s Cuban Americans, Obama beat Romney 49%-47%. Other polls report similar results, with Romney only narrowly beating Obama in this demographic 52%-48%. If correct, they represent a watershed moment in Cuban American politics. For over a decade scholars and pundits have predicted that owing to changing demographics, Cuban Americans would gradually become Democratic. In one of the key cases in my book, I show that the influence of early Cuban immigrants, political refugees who are staunchly Republican and anti-Castro, is gradually being diluted by moderates who support reducing barriers to trade and travel with Cuba who came after the Mariel Boatlift of 1980. My research, as well as close examination of the data, call Tuesday’s poll results into question. Such a shift would indicate a drop in GOP support on the order of 10-15 points. Consistent with research on political incorporation, in a recent paper with Casey Klofstad, we find that the effects of recent demographic changes among Cuban Americans are slow to take root in the electorate as the economic circumstances that drove their migration appear to serve as a barrier to citizenship and participation. While those who immigrated after Mariel made up a majority of Cuban American immigrants, in 2008 they constituted only 20% of the Cuban American immigrants in the electorate. Moreover, the children and grandchildren of these early immigrants were still solidly Republican. Exit polling of minority groups in Florida is notoriously unreliable as well. Typically, the national organizations poll at fewer than 50 locations statewide, a number insufficient to fully reflect a population that tends to be homogeneous in any particular place, but tends to hold heterogeneous political attitudes across the state. While Miami’s Cuban Americans have a reputation for touting the hard line against Fidel Castro, for example, those across the state in Hillsborough County, which has the third largest Cuban American population of any county in the US, tend to be much more moderate. Survey researchers have long recognized this difficulty. Moreover, these exit polls are poorly designed to capture Latinos’ preferences more generally as, for instance, they seldom even identify Puerto Ricans who have had a large influence on recent elections, and are almost as numerous in Florida’s electorate as are Cubans. Even Cuban Americans outside of Florida (where almost one-third reside) aren’t identified in the National Exit Poll thus preventing us from drawing inferences about their preferences nationally. Recent strides have been made, however, through the work of groups like Latino Decisions who sample states with large Latino populations by telephone. In stark contrast to the National Exit Poll, their results show Romney taking 64% of Florida’s Cuban American vote, a number much more consistent with historical averages. Nationally, they find that Cuban Americans supported Romney at a 54% clip. These numbers are much more in line with academic research. While the Latino Decisions poll seems to be much better designed to accurately capture the views of this community, additional evidence is seen by examining election results. At 47.3% of the national population, Miami Dade County is an ideal place to look, as it is the most populous Cuban American county in the nation. 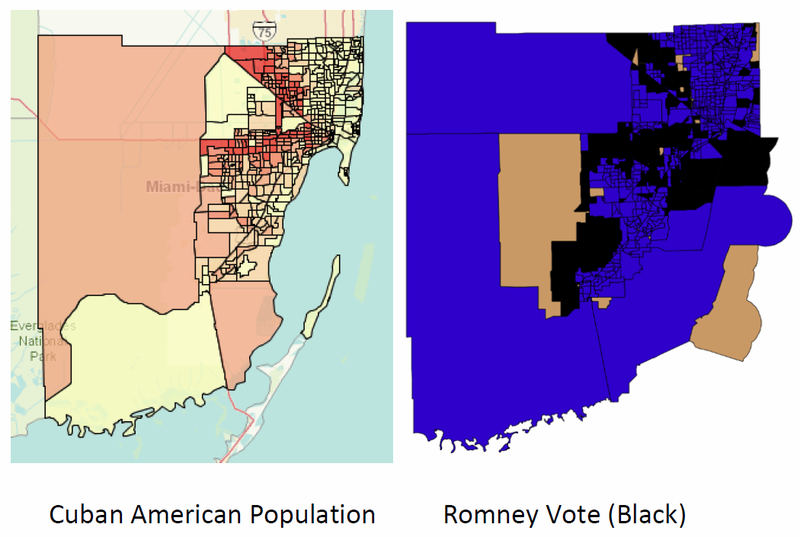 The maps below compare the density of the Cuban American population in Miami Dade County, taken from the 2010 Census, with the unofficial presidential election results map. On the left, darker red areas indicate larger concentrations of Cuban Americans, while on the right graph, areas that voted for Romney are colored black. While these maps cannot be created on precisely the same scales, they are nonetheless highly suggestive. These maps show that while Cuban Americans were far from Romney’s only base of support, the areas with the largest populations are areas that supported Romney. While it is possible that Romney won only narrowly in these areas, it seems unlikely. Like most cities, much of Miami’s population is segregated such that Cuban Americans tend to be highly geographically concentrated. Moreover, the non-Cuban Latinos in these districts are also likely to be Latino. If Cuban Americans only narrowly supported Romney, we might then expect the non-Cuban Latinos, who tend to vote heavily Democratic, to swing these areas toward Obama. After all, recall that the National Exit Poll claims that Obama won the Cuban-American vote. We see little evidence of this. While research shows that while Cuban Americans’ attitudes have been moderating for some time, change in the electorate’s voting behavior has occurred very slowly. Whether Cuban Americans vote significantly more Democratic over time remains to be seen. After all, the influx of moderate Cubans may be offset by growth among the still Republican (though less so) second and third generations. Recent immigrants are also moving beyond the enclave of Florida to places where politics may be less intensely focused on US foreign policy toward Cuba (e.g., California) and hence less staunchly Republican. To date, there appears to be little evidence that major change has occurred. The evidence presented here suggests that claims about dramatic changes in the Cuban American electorate are premature. Exit polls that employ cluster sampling may have problems in assessing attitudes among politically and geographically heterogeneous communities. Telephone polls, in contrast, find strong support for Mitt Romney, consistent with expectations from past research. Finally, comparison of demographic data and voting patterns suggest that the Cuban American community voted for Romney. While this community is doubtlessly undergoing significant changes, the political outcome of this tumult is still uncertain. Little Havana does not yet appear to have turned blue. Outside Spending in House Races: Did It Even Matter? 17 Responses to Did Little Havana Just Go Blue? Given the conflict between the exit polling and the Latino Decisions data, this seems like a case where using a careful ecological inference model to infer precinct level Cuban-American votes might help to resolve the uncertainty. Dario Moreno and I did an ecological inference (three actually, using the classically-flawed original ecological regression model, homogeneous Cuban precincts, and a hierarchical model using both precinct-level Hispanic voter data and city-level Cuban-identity data). The three methods were in general agreement: a median of 48% of Cuban-Americans voted for Obama and a mean of 55%. .. also, there seems to definitely be a generational and class component, since Hialeah pretty much unambigiously went for Obama, while Miami went about 30% for Obama, among the Cuban population. This is great, thanks. To clarify, are you saying your mean estimate for OBAMA is 55% of the Cuban American vote? If so, your results say that the exit polls UNDERSTATE Cuban support for Obama. That’s on the lower end of what i would have expected ROMNEY to have gotten. When I look at the Hialeah map, I can find only 15 precincts where Obama even won. Many of these Obama wins were narrow, and when you look at the population density map, these don’t look like the most densely Cuban neighborhoods (but there is some slippage across the two maps). Only about 3 have big margins for him (and one of those has very few voters- he got about 40 votes there). To double check, I got a list of the precincts that correspond to Hialeah and calculated the two party vote total across all of those precincts. It appears that Romney won Hialeah with 54.3% of the two-party vote. But I note that I have only counted precincts listed as Hialeah by the Election Secretary (e.g., not Hialeah Gardens, or unincorporated Dade). Taking a step back, it would seem that if Hialeah, which is about 75% Cuban American and 95% Hispanic went for Romney at ~54%, the Cuban vote there was almost certainly higher than 54% since the non-Cuban Hispanics tend to go strongly for Democrats (although there is a decent sized (~3%) Colombian population there which trends more Republican). On the flip side, the Miami numbers seem a little high to me. I haven’t gone through these systematically, but eyeballing I cant recall more than a few precincts where Romney even reaches 70%, but I have primarily looked along the Calle Ocho corridor. I definitely agree with your generation and class findings. In our PRQ paper we found that that first generation of the pre-Mariel wave were most Republican, followed by the third generation with the second generation in between. But our sample sizes for these groups weren’t huge, so we didn’t make a lot about them (interestingly Carol Uhlaner reports something similar with Vietnamese immigrants in Orange County). And all were still Republican, just to varying degrees. The pre-Mariel immigrants, who are much more Republican, are financially much better off than the more recent immigrants. As you probably know, ecological regressions are always, ALWAYS in serious need of a sanity check, especially since the sizes of the precincts are WILDLY different in Miami-Dade, and without a careful consideration of this, ecological regressions can tell you some crazy things. I just posted those numbers to give some context to this growing argument that Obama actually “won” the Cuban vote. You’ve probably seen it all over the media in the past few days (as you know, the New York Times has been trying to write that article for 25 years!!). Based on all the different analyses done by people using different methods, I think the safest answer with preliminary data like I have here is “we don’t know”. In fact, we won’t even have a full picture of the absentee ballots until November 18(!) and as you know many older Cubans use Absentee ballots (sometimes more than once in the same election, but that is another story!). I think what everybody who studies this can agree on at this point is this: the Democrats had their best showing in the “modern” era among South Florida Cubans this year than they ever have in presidential elections. The fact that we are even debating whether or not Obama won the Cuban vote shows just how much influence the GOP has lost with Cuban-Americans. The relaxation of travel and remittances to Cuba by Obama certainly played a big hand in this. The fact that Obama did better in Hialeah, where most recent arrivals from Cuba tend to move to, versus Westchester, where most of the older more hard-line Cubans live in, is certainly no surprise. Here are two maps comparing the 2008 and 2012 vote by precinct. As can be clearly seen, Pres. Obama outperformed his 08 numbers in heavily Cuban areas such as Hialeah, Hialeah Gardens and Miami Lakes, winning many more precincts this time around. And yet the Latino Decisions Poll and Mr. Bishin want us to believe that Pres. Obama still received the exact same percentages that he did in 2008? Rubbish. Since the Latino Decisions poll was done before the election, along with the pathetic Mason-Dixon poll which showed Obama only getting 19% of the Cuban vote, its clear that they under-sampled new Cuban voters in favor of traditional voters who tend to vote GOP. So far we have three exit polls on the Cuban-American vote, and they have Obama at either 47%, 49%, or 51%. Those are pretty consistent numbers. Mr. Bishin, if you have any evidence to disprove these numbers and show why they, and not Latino Decisions, should be considered outliers, by all means, show us. The balance of the evidence suggests that Romney solidly won the Cuban American vote. I agree with Kevin who notes that the outstanding question is: By how much? The evidence supporting the contention that Obama won the Cuban vote consists of two exit polls, one of which is the National Exit Poll, the other a firm that worked for Obama (I am not aware of a third exit poll suggesting that Obama won among Cubans). Precinct level change across elections doesn’t really help us much here. On the other side you have the Latino Decisions poll which was conducted on the eve of Election Day-a point by which about half of the ballots had been cast. A large body of academic research suggesting that such communities change slowly (including my own work documenting this fact among Cuban Americans), as well as the ecological inference analysis, performed by Dario Moreno and Kevin Hill (if you read their statement published in the herald, their models estimate the Cuban American Romney vote in Miami Dade to be about 58%) also support the contention that Obama lost among Cuban Americans. In the note above you can find my analysis showing that Romney got about 54.3% of the vote in Hialeah with his highest totals in the most Cuban areas, suggesting that it was the non-Cuban voters there that brought Romney’s vote down. We also know that exit polls that are based on cluster sampling (like the NEP) can be highly problematic for estimating attitudes and behavior when groups are homogenous within but heterogeneous across clusters. We will know more about the extent to which this occurred when the raw exit poll data are released in a few months. I can tell from my own analysis that this has been a problem in the past. So, by how much did Romney win among Cuban Americans in Florida? The estimates Hill and Moreno provide are from Miami Dade County which we would expect to be more Republican and conservative than other counties and so, they probably indicate an upper boundary. Remember that Miami Dade has, by far, the largest number of Cuban Americans in Florida, so whatever totals he posted here should diminish slightly once the other counties are considered (unless the margins were overwhelmingly in Obama’s favor; we just don’t yet know enough to say). Also, the Latino Decisions data seem likely to over-sample upper class, better educated, and older, Cuban Americans who are also likely to be more Republican and disproportionately disposed to vote for Romney. So the true number seems likely to be below their estimate as well. For now, I feel confident agreeing with Kevin that Obama almost certainly had the best showing among Cuban Americans of any Democrat in the modern era. The question we don’t yet know the answer to is, exactly how well did he do? I took samples of actual voting results including all ballots (absentee and early voting) in 3 major areas of high Cuban American vote ratio: W. Hialeah, Sweetwater, and Westchester. The final average was 66% for Romney, 34% for Obama. Consider also that these samples are partially contaminated by pro-Obama demographics from other groups. Therefore, Romney won the Cuban vote by at least a 2 to 1 margin. And where is your evidence for that sample, Luis Cal? Just posting something on a blog does not make it so. Please give us a link to confirm your study, which seems absurd when you consider that even right-wing Cuban-Americans concede Obama won a higher percentage of the Cuban vote than he did last time(35%). 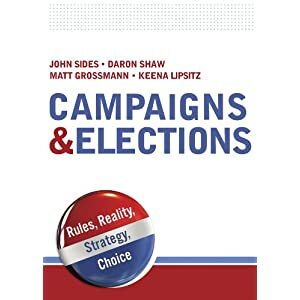 Mr. Bishin, if your going to mention that Bendixen has done polls for the Obama campaign, then you should also mention that Dario Moreno is a known partisan Republican. You also say Romney solidly won the Cuban vote, then you say Obama easily had the best performance for a Democrat among Cubans, and that Miami-Dade Cubans are more Republican than others in the State, so please tell me what exactly is your definition of solidly? And you are aware that the Bendixen poll includes Cubans outside of Miami-Dade, so if anything its more representative of the Cuban population as a whole. And why did i not see all these complaints about polls when Mason-Dixon had Obama losing the Cuban vote 76-19? Gee, i wonder. Fact is most of these pre-election polls that were done of likely voters under-sampled and under-estimated the votes of Cuban-Americans who have arrived here in recent years and the younger generation. Notice how no one mentions Joe Garcia’s victory over David Rivera, the first for a Cuban-American Democrat in South Florida. NB: The Herald reporter only got our analyses partly correct (imagine that). That reporter seems to have an agenda that he wants to gin up some sort of Miami-style controversy. Fine. I’ve lived here for 20 years and am used to it. Dario loves homogenous precinct analysis, and that’s where the (overly-specific, I might add) 58% Romney number comes from. Now, I am not a big fan of homogenous precinct analysis because of common sense: a Cuban voter who lives in an area that is 80% Hispanic, where 70% of the Hispanics are Cuban could very logically be a very different voter than a Cuban who lives in a 20% Hispanic area, or a Cuban who lives in an 80% Hispanic area where most Hispanics are not Cuban. That’s why I prefer other ecological inference methods, even though these, of course, are also treacherous sometimes. Now, this did not make it into the Herald article (probably because it is not exactly the kind of thing a local political reporter can process), but the residuals in the ecological regressions are, as you might imagine, WILDLY heteroskedastic “to the right” (the residuals plotted against either % precinct Hispanic or estimated % precinct Cuban look like a fan opening to the right). That analysis gets us Romney 52% instead of the 58% for the homogeneous precinct analysis, but even though the point estimate is 52% Romney, the 95% confidence interval on that regression coefficient is huge!!! The model does not fit very well, and the residuals are out of whack like I said. Try explaining that to a local reporter. We all need to take a breath, wait for the final data broken out by early voting, absentee, and election day (which Dade does provide eventually in a final form), and see what we can find. Maybe by then the peeing contest ginned up by The Herald and our local partisans will have calmed down, or at least moved into the background. Ah, doing social science in Miami is SO FUN sometimes!! Also, I agree that the Garcia-Rivera vote will be a very interesting one to analyze closely. That district was substantially changed from its old incarnation (the biggest change being the addition of all of Monroe County). People can analyze all they want. Fact is Obama won Florida, and the election, and Joe Garcia trounced Rivera. That’s all that matters at the end of the day. Daniel: I raised the point about Bendixen working for Obama because he was a candidate in this election and we typically take a candidate’s pollster’s numbers about that candidate with a grain of salt. Let me emphasize that I have great respect for Sergio and their firm. I’m not aware of Dario Moreno doing polling for Romney, but regardless, the analysis they present is not based on polling data and so it is not relevant in my view as they have little control over the official election results. How do I define solidly? Well, to be consistent, in my academic writing I usually use victory margins of greater than 5-10 points, so that will do here. I would be quite surprised if the true margin was less than say 53%. I would guess the final number will be somewhere around 55% or so (statewide) when the best numbers are in. Kevin: Ha! I often have trouble getting even my grad students to understand heteroskedasticity! Journalists? forget about it! I wonder: Is some of that related to the varying number of voters across precincts? Gotcha on the homogeneous precincts too–that makes sense. I can empathize entirely. I think I will be at FIU for the FPSA next spring. We should grab a beer and compare notes. Here is Bendixen’s official reply to all the nonsense about his polls being inaccurate. They key here is that Bendixen himself acknowledges that Obama lost the Cuban-American vote in Miami-Dade 56-44, but he made up for it by winning Cubans outside of Miami-Dade 59-41, Cubans whom Moreno and Hill did not poll, and whom GOP Cubans tend to conveniently leave out of all these conversations. The Bendixen and Amandi letter is incorrect on numerous factual points to the point that it is difficult to take seriously. They clearly have either not read or do not understand the analyses conducted on this topic to which they respond. Consequently, it is not especially constructive for helping us understand how change is occurring in this community. I invite them to release their data, describe their methodology, including sampling strategy, response rates, etc., and weights used, in order to allow us to assess the accuracy of their poll. Really, Ben? Bendixen, unlike Moreno and Hill, actually polled people and asked them who they voted for. You say they are inaccurate, and yet you provide not one shred of evidence. You haven’t even asked Moreno or Hill to release their data. I don’t see why Bendixen has to prove himself you. Your bias is clearly showing, Ben. The Cuban-American community has changed, whether you like it or not. Deal with it and get over it.